For the first time, representatives of all six nations along the course of the Mekong River are taking part in an ICE WaRM international Professional Development Programme (PDP). 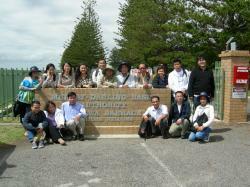 The group of 17 from the Mekong River Commission member countries – Cambodia, Laos, Thailand and Vietnam – plus their dialogue partners China and Myanmar are spending a month in Australia studying capacity building initiatives. The nine men and eight women are senior staff from tertiary institutions and water authorities in the six countries. The programme, which is majority funded under AusAID’s continuing Australian Leadership Awards scheme, is based in Adelaide, with intensive short courses, workshops and field visits focusing on building capabilities to manage water resources for an increasingly complex and uncertain future. The group will also tour sites in regional South Australia and Queensland. The Mekong River Commission is a river basin organisation which supports decisions and promotes action on sustainable development and the alleviation of poverty. It was formed in 1995 with the four downstream countries as full members. Subsequently China and Myanmar progressed from observer status to become dialogue partners and the six countries now work closely together.